Well, I am very happy for Alex. Anybody have any idea on what they are having? Hay Wouldn’t a little girl me nice. I can just see Alex being protective of his little angel:) Also I watched the Fatal Honeymoon on Lifetime with Amber Clayton. She was great. This is now the fourth movie I seen her in, hoping she makes it big just like Holly. Looks like she lost some weight since the last movie I seen, but still can see Alex’s interest. Hay ladies, Amber Clayton is staring in a Lifetime movie Saturday 25th at 8:00. I’m so glad she’s getting on with her life. The pictures of her crying at the airport when Alex left her broke my heart. She is so beautiful and seems down to earth sweet. I’m hoping this latest news hasn’t caused her more pain. There were pictures of Amber crytnng when Alex left her? How are u sure those pictures are of that event? I never seen those pictures or knew there were pictures about it. What I could not believe because I did not knopw was that Holly and Alex dated tht long 4 yrs. How long amber and Alex dated? HI Cinthia, is ther a way I can get it to you with out posting it here? Hello Marie, Well u can but I do know know if we are allowed here to exchange email address, I do not know the site policies on that. Anyone knows if there is rule or policy? what a good way for her to stay in the lime light, hope she is not planning to send this child to school at 2 years old. I cant deny the fact that Im curious about how far is she in her pregnancy. I believe that during Alex rehab March-April I bet he did not have mmmm u know what. For a pregnant woman to be noticeable, she must be like 3 or 4 motnhs pregnant so my guess is she got pregnant right after Alex rehab treatment. Alex dated Holly for 4 years. I do not know as noone knows as only Alex knows, if for Alex, Malia is the one for him, and he will like to settle with her, even if each one had kids from previous relationhsip and also who they have to take care of and they have been dating like 9moths or so. My curiosity always had been why Alex was never seen with Malia on a regular basis when Alex was at different events social mostly, on the contrary Alex was always seen with Holly and people took pictures of them together and Alex did not seem to mind back then. Perhaps Alex is too protective of Malia now as he has grown up more? but he was not liek that with either Amber or Holly. In fact there are pictures of Amber when H50 was premiered 2 yrs ago during some CBS press party. So I do wonder why Alex does not like to be seen with Malia and if it is because Malia do not like to get hounded by media, or she does not like to be seen in public with the guy she loves, or what it is. It is just a curiosity I have. I mean if you ask me my only answer is, I bet this pregnancy was unexpected and unplanned that is the only thing I have to say. I am not happy either Im only happy for Alex, he deserves to be happy for sure I wish she will know what a great true lovable guy she has on her side and hopefully she stays true to him. Cinitha= I think your right about it not being planned, I also was thinking it happened after rehab( I’m hoping she wasn’t with someone else WHILE he was in rehab!! She has two other short marriages, and a son born shortley after her 2nd marriage and shortley before Alex. I really hope Alex is happy but I too am curious!! Ladies again I have to break the news to you. Alex and Malia are expecting a child together. Where I read it, it does not say how many months pregnant Malia is. Ladies, for those who are planning to go to Hawaii in September, it is official: there is going to be a SOTB for the third season. CBS announced it today. It will take place Sunday September 23 in the afternoon. She’s also daughter of Bruce Jenner. I have to share these good news for all of us fans and I hope Tiffany will be able to get some footage to post here of this Sundays Event. This Sunday is the CBS Summer Press Tour 2012 and for us the lucky ladies Alex, Peter and Scott will participate 😀 :kiss: Last year H-50 did not participate at the conference, so it has been 2 years H50 was first presented. I am sure there will be photos and articles or even red carpet photos when the stars are arriving at the hotel the event will take place. You can even participate by posting questions for them via Twitter or FB at the CBS Facebook page. With any luck, we might see our own questions answered either by Alex, Scott or Peter. Doubtful I will be able to post about this until much later. I am headed to NYC with some girlfriends. Taryn Manning to return to Hawaii to reprise her role as Mary Mcg in order to see with her own eyes that her mom is alive and kicking. I thought the same about the pic with the baby. Listen ladies in October there is going to be a new H50 episode that involves once again Steve being shirtless!! So good !!! Bad news. H50 or the cast were not consider to be nominated for Emmy Awards this year. Only the stunt coordinator for the show Jeff Cadiente got a nom. Why do u think the show or the cast lately had not been consider to be nominated for big awards this year? You know Cinthia that is a good question. There is no doubt a huge following of H50 and it has all the qualifications to be nominated. The stories are great and the cast is awesome. Makes you wonder how much of the choosing is favoritism and who chooses. In spite we know our crew will do the best job they can for their fans,. Thanks Linda. I heard mixed reviews from fans as to why. Some say H50 it is difficult to categorize is it drama or comedy since there are no categories in between. Other says there was a lot of competition from other big and popular shows in one category and others say that H50 is not quite there yet, maybe in time but not yet. and the show will catch on more and get better and better, but they think the writing has to be better, like the former show 24 where each nite the show was excitng and you could not leave your seat because the person did not know what was going to happen next , H50 need to be like a 24 in writing wise so for some fans H50 is not there yet. It can be but it needs more work and eventually in time it can happen and as u noticed this year most nominations went to cable shows not on TV networks, that should worry I am sure the major tv network exectuves. Hi Cinthia, Read your answer and understood what you were saying. Funny thing is, remember Alex won the first year of H50 for I believe, best new Drama actor. If I messed up please forgive. Also, Scott was up for award too one year. So my opinion being a Police show it would Drama like the rest of them.Just nice to have humor too. I would think NCIS is considered Drama and they have humor too. As for some thinking H50 not there yet. Geez! How much more can they give. I think CBS needs to step up the advertisement on this show like they did when it first came on. Great actors, plots has it all. Can’t win them all right. LOL! I dont recall Alex had won an award before for H50 2 yrs ago., I do remmeber though that Scott was nominated for a Golden Globe in the frist year of H50 but I believe he did not win. If anyone can confirm what I just say or not confirm it you are free to tell. Hi Cinthia, Yes it was the first season. I never watch awards but, because he was nominated I did. Was crazy happy he won. I too, was sad Scott didn’t win and that year alex wasn’t nominated. Flaky business. I was also happy when alex won GQ. Lets face it anytime theres a win it is great LOL! I agree, I am sorry I stink with remembering all the details but it was the first season when alex won. H50 I believe was up for best new tv drama too but, I believe alex is the only win. I agree also, feel free for anyone who can give better details then me! I just know I was jumping for joy not easy for an old lady LOL! well, not that old but old enough. Have a good day. We should start a campaign “Alex to play Christian Grey in the 50 shades of Grey movie”! 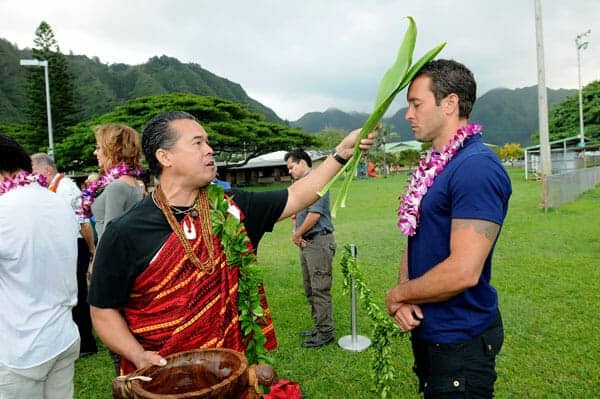 Tiffany, thank for sharing the photo of Alex at the Blessing Ceremony. I wish Alex and the H5O team my very best for their third season. They did not know AOL was Aussie? That is odd for sure. I did heard quite some time I dont remember from where that in Australia, either Alex is not very famous as he moved to USA to pursue his filming career after he made some films in Australia or the show is not famous there in his hometown for the same reason. tiff thank you for sharing this gorgeous pic, cinthia blue is definatley his colour, matching his dark hair and big blue eyes! can’t wait to see season three. big hugs and kisses to alex and the rest of the cast. loadsalove to you all. Hi girls, thanks Tiff and all who posted about the ceremony. I must check this more I almost missed it. I agree it was really special as I love that they did traditional ceremony. The culture is so beautiful. I too wish them the best and an even better season3. I am just happy we get to have another season of watching alex and the crew. Thanks Tiffany. I loved watching the Blessing Ceremony this morning. How fortunate are we to be able to do so. Alex looks fantastic. :heart: Loved the interview Tannya did with him but wished they had left out all those clips…considering they were about to start filming, we were lucky to get as much as we did. The blessing ceremony was beautiful, even though it started to rain. It started around 9:50 West Coast time, which was very manageable. Good Luck to everyone and congratulations on the new season. Linda I agree with you on the things you wish to see this Season 3 and I will add some more. I also like that Steve mother reason for being absent will be believable, more character development, more action and most important, better scripts and better stories with this I am saying that I hope that the addition to H50 of new writers those things will be pretty exciting and interesting as I read that some writers from CSI NY will join H50 to write scripts this season. As far as the Alex thing, for me all 4 core cast are equally important but I do have to acknowledge that Alex is the main character there so I hope he stay safe this season. Cinthia, even though I watch HF-0 because of Alex, I like all of the Core 4. They are the best team on television these days. We fans really lucked out with their great chemistry. Nice, thanks Tiffany I m very happy cast and crew are back to work. Alex looked incredible GOOD!! Blue definitely is his color!!!!!!!!!!!!!!! :love: :heart: I hope all the cast and crew rested enough in order to start working with good vives and positve thoughts! I manage to see the blessing and this year for me, it was more touching than last year as this year they had more Hawaiian traditions involved than just the usual praying among all the attendees. Alex Playing Rugby in Pittsburgh!